A bundle of boneless pork chunks discovered in my freezer this week sent me browsing through cookbooks for a recipe to make with it. A dish we always enjoy is pork long cooked in tomato sauce for pasta, but I wanted something different for a change. 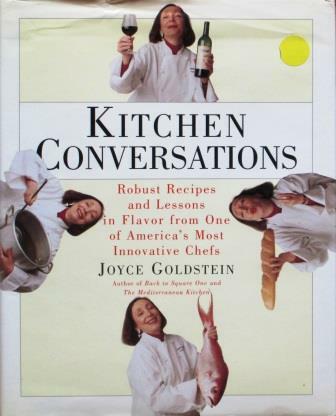 When it’s the unusual I’m looking for, I often turn to Joyce Goldstein’s Kitchen Conversations, a book whose gonzo recipes I’ve written about several times before, making them with various degrees of success; e.g., here and here. 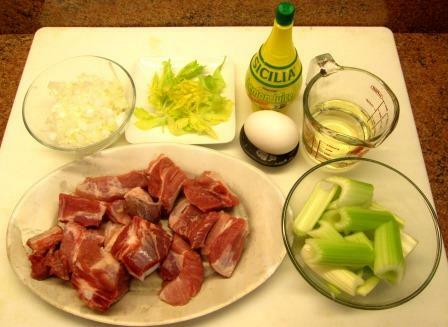 The Hirino me Selino Avgolemono recipe I found there this time – in English, a Greek pork and celery stew – filled the bill for me: I know almost nothing about Greek cooking. The recipe looked straightforward, and I thought the sauce with the avgolemono mixture of egg yolk and lemon juice would be an intriguing taste experience. And so it was. I gathered my ingredients and went to work. First was browning the small-cut pieces of pork in olive oil; quickly over high heat, as instructed. Next I took the meat out of the pan and put in the chopped onions. These were to cook 8 to 10 minutes – which, if I’d left the pan over high heat, would have incinerated them. I’ve found Goldstein’s recipes often sloppy about such details. I turned the gas way down and cooked the onions gently. The pork then rejoined the onions, along with half a cup of white wine and a cup of water. The recipe also didn’t say to deglaze the pan, but it certainly needed deglazing, so I did – then covered and simmered it for 35 minutes. At that point I added the celery. 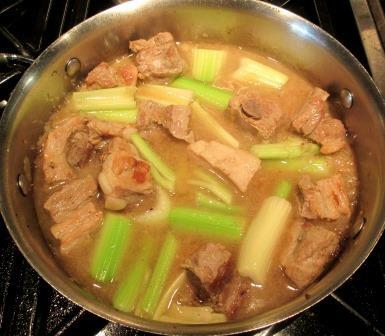 After about 20 more minutes of simmering, both pork and celery were tender. I removed them to a warm platter and quickly reduced the remaining liquid in the pan. Meanwhile I’d beaten an egg yolk with two tablespoons of lemon juice. Into that I stirred small spoonsful of the pan juices to keep the egg from coagulating when it hit the heat, then added the egg-and-lemon mixture to the pan along with some salt and pepper, and poured the finished sauce over the platter of pork and celery. 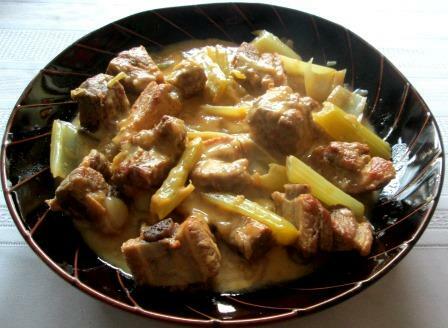 It was a good dinner dish – very interesting in the combination of the smooth, sharp avgolemono sauce, the sweet pork, and the astringent celery. It was a bit reminiscent of what in my youth used to be called fricassee, usually made with chicken. I don’t know whether this recipe is an authentic version of the Greek dish (some of Goldstein’s ethnic creations are very idiosyncratic), but it was quite enjoyable. 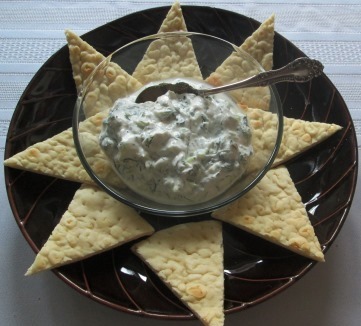 Oh, and I’ll add that I preceded the stew with an appetizer of my only prior Greek culinary accomplishment: a bowl of homemade tzatziki, to be scooped up with triangles of toasted pita bread.